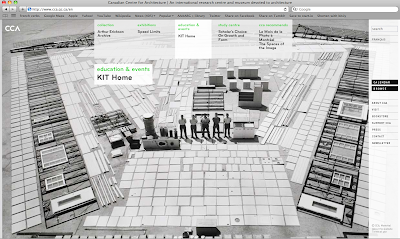 In terms of architecture web portals, you could do (a lot) worse than check out the Canadian Center for Architecture's (CCA's) new website. Designed by Bluesponge (the same collective responsible for the award-winning madeinmtl), the new site not only features a list of events at the Center, but offers a nice peek at the wealth of educational programming offered there every year. Spend a couple of minutes on the site, and you can sample excerpts from exhibitions such as Lessons from Bernard Rudofsky (2007), 1973: Sorry, Out of Gas (2007), and the recent Speed Limits. The latter is especially nice, as it includes links to .mp3 of lectures by scholars like Jeffrey Meikle, Jeffrey T. Schnapp, and others. More impressive, however, is how the site allows visitors to sample the CCA's architecture archives. A feature called "Scholar's Choice" connects to a brief commentary by a leading scholar on articles in the CCA's holdings, from drawings of Cedric Price's Fun Palace, to images from D'Arcy Thompson's On Growth and Form, and others. Go take a look, when you get the chance. Not only an impressive design, but there's a great wealth of resources on the site. Also nice to see clean photography and several different images on the site since its launch, definitely keeps you going back for more.